I rant, rave, and review video games. Sometimes I might throw a tid bit of this or that, just for fun. 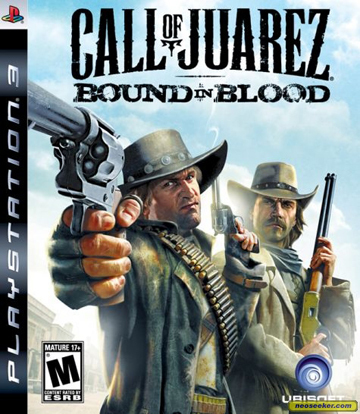 I received Call of Juarez : Bound in Blood with high hopes. I love a good western and the thought of blazing my way through old west towns seemed very appealing. The story is based around Thomas and Ray McCall. Two brothers that fought in the Civil War, deserted their troop to save their family homestead, and became outlaws. Their younger brother William narrates the story. Through out the game you choose between the two brothers. Each brother has different strengths, such as Ray can open doors, Thomas can climb trees. I knew it was downhill when I realized that one of the brothers could not operate a doorknob. Pros : Great scenery and graphics, large amount of weapons, and you get to wear a cowboy hat. Cons : Horrible voice acting, bad controls, choppy cut scenes, and checkpoints every 20 feet. The script must have been written by a sixth grader who just learned how to swear. Normally, “dirty” words do not bother me. Cussing should be used where it fits. There is no reason to say GD about every person or object. It lingered in the air and often made you ask “Why?” There was no reason for some of the dialogue. The banter between the brothers is often annoying and petty. You gain no feeling for the characters and could really care less if someone dies. The pacing of the fights seemed strained. Once you got to the objective there would be a delay to find out where to go or what to do next. Some parts of the action sequences did not add to the action. For example,you are in a stagecoach, running through the town. You are told to get out and push a cart out of the way, the game tells you the control but nothing happens. You then are told to get back on, you turn the stagecoach around and go the way you came. This is an ammo waster. Due to poorly thought out controls and gameplay, I had no interest in finishing the game. It drained the fun right out of the wild west ride that it should have been. My advice would be to save the cash. The Damned Things : Just go buy the damn thing! Lara Croft and the Guardian of Light : Go get it!